This Metroidvania game surprised and delighted us. 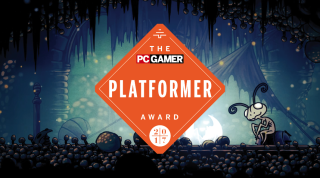 PC Gamer's Best Platformer of 2017 is Hollow Knight. Below, several writers who championed the game during our GOTY nominations process share their thoughts on why it's so great. Check out our GOTY hub for the rest of our awards. Wes Fenlon: In a genre built around backtracking and finding new paths as you gather abilities, Hollow Knight took a big risk by filing away at its critical path until its guidance was eroded to the bare minimum. The underground world of Hallownest is massive and labyrinthine, and it's almost entirely up to you to figure out how to explore it. I expected a world the size of a Metroid planet or a Castlevania castle, but what I got was something far bigger, and always better thought-out than I expected. But that wouldn't mean anything if Hollow Knight didn't feel great to play, and I still marvel at how simply and elegantly it scales up your health and damage as you go. You'll only gain a few extra hit points over the course of the game, so mastering the art of jumping and dodging, finding gaps in combat to heal yourself, remains satisfying for dozens of hours. Every hit and bounce feels precise and percussive, and that keeps backtracking from ever feeling like much of a chore. Exploring always pays off because that world is so smartly laid out and mysterious enough to spur you ever onward, looking for the next new sight or secret passage. The joy of Hollow Knight is the joy of discovery, always hard-earned, never handed to you. I don't expect to meet people in this sort of game. They tend to be quite cold games about keys, enemies and weapon upgrades. James Davenport: Talking about Hollow Knight was difficult when it first came out. A few PCG editors and I were playing it around the same time at a close pace, and we’d consistently tip one another off to an entire area or hidden NPC that the other had blown by dozens of times before. A kingdom of bees with uniquely animated enemies sits behind a wall in a lonely corner of Hallownest, and accessing the White Palace (which feels from a different game entirely) requires visiting the bottom of the world to find pieces of an artifact entirely divorced from the critical path. That’s before making the leap to a different dimension, too. There’s even a bizarre puzzle involving a sentient mushroom that speaks in riddles and seeks to explore the cosmos, but good luck figuring that out on your own. Hollow Knight’s world is so finely detailed that it can afford to squirrel away massive parts of itself, a testament to its beautiful, complicated art and quiet design that teaches you to scrutinize every inch rather than look for the big green glowing door practically begging for a super missile. Tom Senior: I don't expect to meet people in this sort of game. They tend to be quite cold games about keys, enemies and weapon upgrades. Hollow Knight adds a cast of interesting, sad characters pressing on in the ashes of their civilisation. Really reminds me of another game, Lark Souls? Bark Souls? It’ll come to me. Steven Messner: The juxtaposition of a sullen, decrepit atmosphere with cute-sounding characters is so endearing to me. It'd be like if Pixar made a Mad Max film. I know Dark Souls holds the crown for making mysterious, uneasing characters that slowly reveal their motives and histories, but I far prefer Hollow Knights PG approach. Just because a hot-headed bug warrior with a superiority complex feels ripped out of a Saturday morning cartoon doesn’t mean his journey doesn’t resonate just as deeply. I really thought I had burnt out on metroidvanias after they became so popular again the past two years, but Hollow Knight is the special kind of game that transcends genre fatigue. Suddenly, I’m itching to go exploring and collecting all over again. For more great words on Hollow Knight, check out our review.